Troulos beach: The beach has taken its name from the island located nearby which looks like a dome. 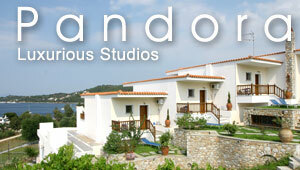 Troulos is situated on the southern coast of the island, 9 km from Skiathos Town. It distinguishes for the crystalline waters, the white golden sand and the high pine trees that provide shadow to the visitors. It is an organized beach with umbrellas, sundecks and many other facilities provided. There is also a lifeguard on a daily basis ensuring the safety of the people inside the water. The area offers various options for accommodation and many taverns and canteens with snacks and cold drinks. Troulos beach has been awarded with the Blue Flag for the services provided to visitors, the great organization and the cleanness and quality of the waters. The natural surrounding is actually a pole of attraction for hundreds of people ever year. The beach is easily reachable by public bus, boat or car.